Everyone knows that you should brush your teeth twice a day and focus on flossing. Did you know that an important piece of the oral hygiene equation involves your tongue? With its bumpy texture and lots of microscopic places for bacteria to take shelter, it can harbor millions of microorganisms. If it isn’t cleaned, it can pave the way for problems like bad breath and ongoing periodontal disease. 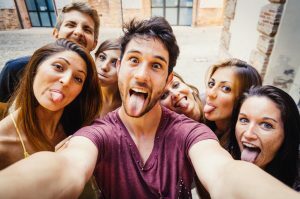 Some of the best dentists in Naperville will tell you why you should be brushing your tongue and what might happen if you don’t. Research shows that one microgram of oral biomass contains around 100 million microbes. As these bacteria feast on the sugars in your mouth left behind after eating and drinking, they multiply and create bacterial acids. These lead to problems like worn enamel, cavities, abscesses, and even oral yeast infections. Unfortunately, bacteria can multiply faster than most people realize, about every five hours. In fact, if you ignore brushing for a full 24 hours, 20 billion oral microbes will become 100 billion microbes! Each emit smelly volatile organic compounds that give you bad breath, duller taste buds, and dental decay. For these reasons, Naperville family dentists recommend cleaning your tongue each time you brush your teeth. There are two basic ways to clean your tongue to inhibit the growth or oral bacteria: brushing and tongue scraping. To brush, apply a small amount of your normal toothpaste to your toothbrush. Using gentle pressure, brush your tongue back to front. Since the majority of oral bacteria take harbor in the center section of your tongue, focus on that area. Tongue scrapers are also helpful in keeping the tongue clean. They remove the biofilm that develops in a single pass. Tongue scrapers are made from a thin, flexible plastic, and you gently run the scraper down the tongue. Be sure to rinse the scraper between passes. To make sure that your tongue looks clean and healthy, talk with your famiyl dentist during your routine checkups. Known as one of the best dentists in Naperville, Dr. Weyneth is completely committed to improving your oral health and making your teeth beautiful and healthy. Schedule your next checkup today!